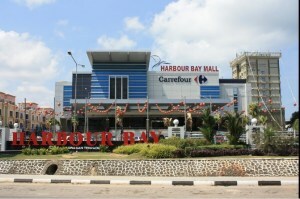 Harbour Bay Mall is located at Harbour Bay Ferry terminal opens its doors recently and still undergoing minor renovation. This 48.000 square meters mall offers the ultimate shopping & leisure experience in Batam. There are 84 shops complete with modern hypermarket and large open-space for smokers. Surrounding areas are local restaurant, Pubs, Cafe and seafood restaurant. Nearby the HarbourBay Mall there are also many of seafood restaurants which offer cheap and fresh seafood to you.